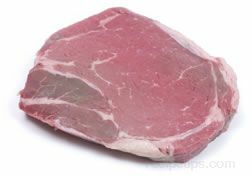 A crosscut steak from the beef sirloin. 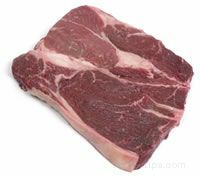 There are several different sirloin beefsteaks and each is given a different name depending on the shape of the piece of hipbone that is contained within the steak: 1) pin bone, which is a crosscut from the front section of the hip, next to the Porterhouse, and is the most tender of the bone-in sirloin steaks; 2) flat bone, which is another crosscut from the front section of the hip; 3) round bone, which is a third crosscut steak from the front section of the hip; and 4) wedge bone, which is the least tender of the four because of its proximity to the rump. 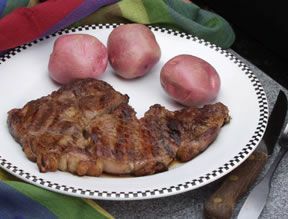 It should be marinated first, which allows it to be grilled, broiled, sautéed, or pan-fried.